Op-Ed: What Can We Learn From Alternative Art Schools? Artivist Taeyoon Choi reflects on a long legacy of academic innovation. Alternative Art School Fair (2016). Courtesy ©AllysonLupovich via Pioneer Works. I've been telling my friends that NEW INC, the New Museum's incubator for art, design, and technology, feels like a postgraduate program. Despite visiting numerous times as a mentor since it opened in 2014, it’s only recently, after participating as a resident in the 2016–2017 cohort, that I realized the depth of the program’s focus on education. Since education and social justice advocacy are common threads for many of the members at NEW INC, I'd like to share what I learned at a remarkable gathering of alternative educators that happened a few months ago. 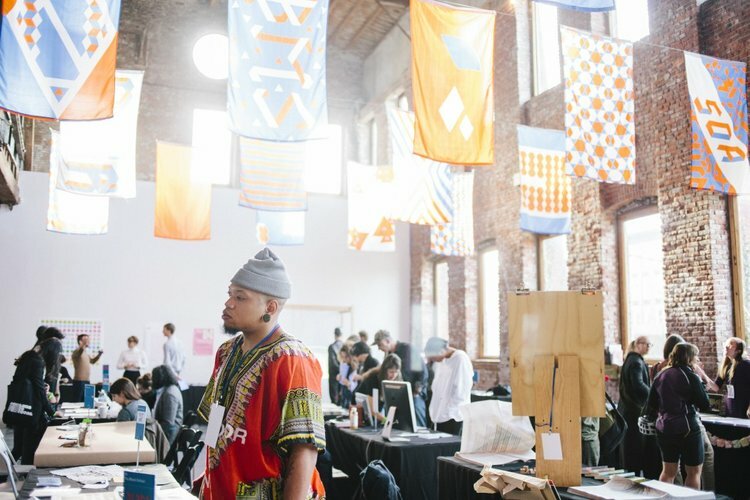 Last November, Brooklyn-based non-profit Pioneer Works hosted the first Alternative Art School Fair. Catherine Despont, the fair's lead organizer and co-director of education, invited me to present two of my pedagogic collaborations: School for Poetic Computation and Uncertainty School. With fifty schools in attendance, many of which arrived from out of town or from overseas, the event featured information booths, lectures, and workshops along with stimulating conversations, provocations, and community-building moments. 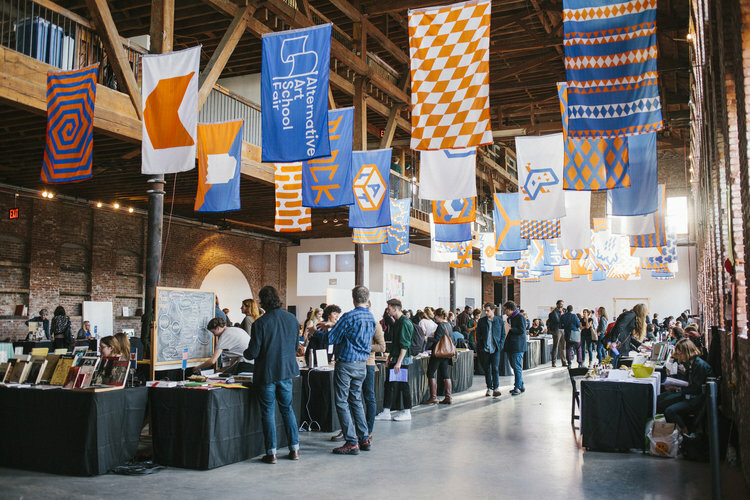 Pioneer Works' giant gallery space was filled with an energy similar to an Art Book Fair, and featured an array of flags representing the participating organizations that were reminiscent of Hogwarts School of Witchcraft and Wizardry. There, I met with practitioners in alternative education that inspired me to dig deeper. Victoria Sobel, Co-Founder of Free Cooper Union. Courtesy Taeyoon Choi. Between the rising cost of accredited programs like the MFA and the student debt crisis, many artists began exploring the prospect of creating their own schools in the early 2010s. David Batty's article for the Guardian in 2013, "Alternative Art Schools: A Threat to Universities?," described the emergence of new educational projects in the United Kingdom. Some, like the DIY art school in Manchester, were founded on 'survival tactics.' According to Batty, these experimental schools "were set up by art students and recent graduates who could not afford rising course fees and were dissastified with the structure, ethos, and curricula of traditional art degrees." Meanwhile other projects, such as the Open School East, were supported by large cultural institutions, receiving generous funding (around £110,000) from Barbican and Create London. Many wondered if these alternatives were only temporary solutions to the existing models, or if these new models would become establishments of their own over time. Now, we are witnessing both the proliferation of alternative education projects as well as difficulties in sustaining a financial model that keep these programs running. In the US, the situation is strikingly similar. The few affordable or free options that existed went though privatization and suffered from budget cuts, adding to the disenchantment in higher education and the extreme professionalization of the creative sector. The value of the MFA, traditionally considered a terminal degree (in most cases qualifying the candidate to teach at universities), is increasingly questioned, as some explore alternative ways of gaining experiences and professional validations as an artist. Student activist groups like Free Cooper Union address issues of accessibility to higher education, while collectives like BFAMFAPHD provide practical toolkits to examine them. Which brings us to this question: What can an alternative art school do that traditional universities cannot? To find an answer, we can reflect on the history of Black Mountain College, which presents a unique moment in the history of art education. Black Mountain College (BMC) operated between 1933 to 1957 in North Carolina, and merged the liberal philosophy of John Dewey with the Bauhaus’s dedication to craft and design. Exceptional artists and scholars like Josef and Anni Albers, who taught at the Bauhaus before escaping Nazi Germany and emigrating to the US, were invited to teach at the unaccredited liberal arts school where creative arts was considered a central curriculum. Photography class in a cabbage patch at Black Mountain College. Photography by Barbara Morgan. Courtesy Western Regional Archives, State Archives of North Carolina. At her keynote for the Alternative Art School Fair, abstract painter Dorothea Rockburne talked about her time studying at BMC surrounded by luminaries. In her interview with the Black Mountain College Studies journal, Rockburne said: "Well, there were many, many influential teachers. Certainly John Cage. I had always studied dance in Montreal. In my family you came out of the womb enrolled in dance classes, so I had taken ballet, which was then called toe-dancing (laughing). So it was just automatic to check into a Cunningham dance class at Black Mountain. I also took classes with Max Dehn, the mathematics teacher, which revolutionized my life." BMC was a radical space for new ideas and forms of living, and perhaps it's this divergence from academic tradition that inspires artists to challenge their disciplines and create new learning experiences that last for future generations. It was encouraging to see the spirit of BMC's mission in the keynotes at the Alternative Art School Fair. A few schools that participated in the fair are accredited or have formal relationships with a university, but most run independently. Although the fair’s participants represent a small fraction of alternative and independent schools around the world, the selection does reflect a shifting paradigm in education-at-large. The fair itself challenges the notion of accreditation and validation, while simultaneously affirming that both artist-run schools and large institutions can benefit from partnerships. "As Craig Wilkins said, alternative schools don’t exist just to resist the institution," Catherine Despont said in an interview with Art and Education. "They exist because they are necessary for the people who make them. Institutions will absorb what they do and, hopefully, replicate the structures that create more opportunities and more equality." She continued: "We will never have an institutional structure that will make this work unnecessary, because there will always be people who fall outside of the norm. But it’s work that needs to be done on a cultural level, in everyday life, and not just at certain moments when we decide to go to school and be educated. I think we’re purifying the system. The problem is that there’s so much desperation in this moment—how to make money, how to survive—that all the basic elements of life become so difficult to manage." Mary Walling Blackburn, Founder of the Anhoek School. Courtesy Taeyoon Choi. This notion that alternative education is in constant conversation and interaction with larger institutions resonates with projects like Archeworks, a design school, research lab, and think-tank based in Chicago that offers “a postgraduate certificate focused on the skills, techniques and implementation of Public Interest Design." I also think the schools in the fair presented ways in which artists can positively influence their communities. One example, like The Zz (zee) School of Print Media, a printmaking-focused education initiative based in Kansas City, creates opportunities for artists and educators, and encourages them to become teachers. How do we learn together? The political climate of the weekend, charged by the results of the 2016 presidential election, posed complex feelings and challenges. This urgency reminded me of something Carol Becker, another keynote speaker, said in her landmark essay "The Art of Crossing the Street:"
"I inevitably hold my ground and insist that it is unrealistic and inauthentic to presume that there is only one way to be an artist, that artists, at this time, are working in many different ways, with many measures of success and accomplishment. I also assert that ideology is built into all pedagogical models, even in those where it is not explicitly articulated. Our students need to understand the range of choices that artists historically have made and how they might position themselves to be more effective." Her statement inspires artists to embed themselves in their communities and to empower them through teaching. This may happen at the local level. The Black School, another presenter at the AASF, educates Black/PoC students and allies in becoming radical agents of social change by combining art-making workshops, radical Black political theory, group discussions, and public projects that address community needs. Members at NEW INC are also developing new learning environments, creating alternative teaching practices, and sharing information. It is extremely important, now more than ever, as we enter a new era of hostile politics that might dismiss diversity, that we think about education as an integral practice for creative work and technology. I couldn't help but recall the great teachers I had outside of the classrooms, as well as the many gatherings and protests that I had attended over the years where specialized knowledge was a common resource. Listening to folks who work outside of traditional schools, classrooms, and textbooks will enrich future conversations. Editor's Note: You can listen to audio recordings from the Alternative Art School Fair at Clocktower Radio. Taeyoon Choi is an artist and educator based in New York and Seoul. His art practice involves performance, electronics, drawings, and storytelling that often leads to interventions in public spaces. Choi collaborates with fellow artists, activists, and professionals from other fields to realize socially engaged projects and alternative pedagogy. He was an artist-in-residence at Eyebeam Art and Technology Center and Lower Manhattan Cultural Council. He has published books about urbanism and is currently working on a book of drawings about computation. Choi cofounded the School for Poetic Computation in 2013, where he continues to organize and teach. Recently, he's been focusing on unlearning the wall of disability and normalcy, and enhancing accessibility and diversity within art and technology. Choi serves on the board of advisors of the Processing Foundation.